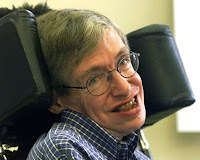 In a May 16, 2011, article on Yahoo's news blog, "The Lookout," Liz Goodwin reported an interview with physicist Stephen Hawking, by Ian Sample. One quote: "There is no heaven or afterlife...that is a fairy story for people afraid of death." Hawking is the kind of person who would make such a bold statement of "nonbelief." As a celebrated physicist and cosmologist, he's been probing the same issues that religion addresses all his life: Where did everything come from? What does it all mean? Who am I? And what will happen to me when I die? This last question carries great amperage and voltage for the world's religions. Most people believe that every person has a soul that survives the death of the body and afterwards moves on to another phase of existence. This next step varies from religion to religion, but this belief is huge "good news," because the idea that one's existence might cease to be is fraught with horror. Human beings are intelligent enough to understand that they will die someday, but most people find the mere contemplation of personal extinction to be practically intolerable. Apparently, Stephen Hawking is different. He seems to have made some kind of leap of acceptance, which is too far for most people to go. They make a leap of faith instead. Hawking has been coping with degenerative Lou Gehrig's disease for nearly 50 years, and he claims he's not afraid of death. And he's created his own set of answers. The explanations he has drawn from science do not require a deity. As for the meaning of life? He declares that a deity isn't needed for that, either, that creating meaning for one's life is an individual responsibility. "We should seek the greatest value of our action," he said. His point of view isn't new or particularly shocking, but it's unusual for a "nonbeliever" to speak out like this. Even though Stephen Hawking can't claim to have the final word on these issues, religious freedom allows people to express their beliefs, whatever they may be. And if believers in God value religious freedom, they need to respect the right of Hawking and other nonbelievers to pursue answers to the great questions in their own way. I particularly like your phrase "leap of acceptance." I found the Hawking interview very interesting. I guess I believe that there is some sort of intelligence at work in the Universe. I'm not up to sticking a label on it. The word God is too loaded. The promise of a fabulous afterlife was the best form of social control of the deprived masses for many centuries. I'm not persuaded as to its truth for this amongst meany other reasons. Definately with Hawkings on this. I want to focus on living the best and most moral life I can now. It seems a rather selfish act to do the same because of a possible payoff for good behaviour when I die. ^^^^ Could not have said it better myself!! Should I wonder where Denny Coates, or Stephen Hawkings, stand in this matter of whether there's an intelligent creator or not? Man has created Gods, but he cannot create the intelligent creator behind every bit of thing in the universe. I'm not kept under control socially by simply accepting there's such a thing as God and faithfully following doctrines in consequence. When I pray, I seek to communicate with a person whom I address as God, but who has told me that his personal name is Jehova, or however it is pronounced and spelled in varying tongues. Events really make it ridiculous sometimes such conclusions as I hold; but, let's really look at the only book--the Bible--that supports the claim and see if it makes any real sense. And, if we were to leave out the Bible, do we make any sense of existence? Have we? We ought not to be too quick to think for this "heavy" God!